I’m not impressed with my inability to resist buying strawberries this early in the season. It’s only March!!! For some reason I’m finding them especially tempting this year and I just can’t stop dreaming about ways to use them. Like this ice cream. The strawberries are so wonderfully sweet, but I think it’s the herbs and spices that give it that je ne sais quoi appeal. I bet your guests won’t be able to guess the secret ingredients are lavender and cardamom. They are subtle yet impactful and work so well with the strawberries. Note: I find this recipe is best when fresh, straight out of the ice cream maker. If you freezer overnight (or longer) it takes quite a while to defrost. 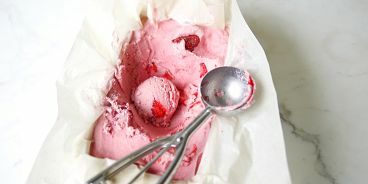 Set aside four or five of your strawberries and chop them into bits (these are the chunks that you’ll add to your ice cream towards the end). Combine all remaining ingredients in a high-powered blender until silky smooth. Have a taste and add more sweetener, salt or herbs, if you like. Place this mixture in the fridge for a few hours to chill. Once cold, add your beautiful pink mixture to your ice cream maker and proceed according to ice cream maker instructions (I churned mine for about 30 minutes). 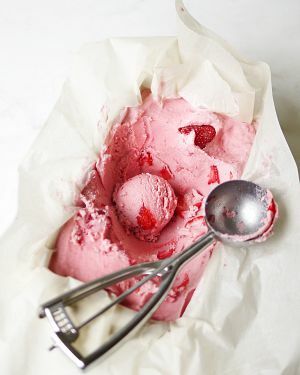 Add in your strawberry chunks about five minutes before the end. At this point I usually transfer my ice cream to a parchment lined baking pan to store in the freezer. Serve with a splash of coconut cream, more chopped strawberries or maybe some freeze-dried strawberries if you have them (my favourite!! ).